I am a week early for this topic, but I like to think I'm ahead of the trends. The reason for this is that I'm off to Rome next week, and I'll be too busy packing and panicking to take part in the meme. But I wanted to share my TBR list with you, because it's a good one. I've only included books that I own, because if I was to include titles on my wishlist then we would be here all day. I adored Variant, and I'm ignoring Feedback's existence, so I'm hoping this is going to be a good one! And it's coming up soon, which makes things even better. I haven't even read the synopsis, because I prefer going into books knowing nothing about them, but whatever, I am excited. I really enjoyed Breathe when I read it last year, and now I'm excited to see how things turn out in this one. Are they going to bring the bad guys down? I haven't read this one since I was eleven, so I think it's a good time for a reread. Especially since Halloween is just around the corner! Nina is thinking about hosting a Stephen King readathon in October, and I immediately "signed up" for it when I saw the tweet. I've only read two books by King, Cell and The Shining, both of which I quite enjoyed. I'm looking forward to reading more of his work, starting with the novella that one of my favourite movies is based on. As above. I adore the movie, and I cannot wait to see how the book matches up. I'm undoubtedly going to cry, so that's always good. I read The Knife of Never Letting Go a while ago, after Daph basically forced it upon me. I adored it, but I have been putting off reading these two because I'm terrified. Tatum read them recently, and apparently Monsters of Men is heartbreaking. I have to be in the right mood to purposely choose a life ruining book! Because I read Wool after Tatum forced me to, and I adored it. My favourite character, Jules, isn't going to be in this book since it's a prequel to Wool, but I don't care. 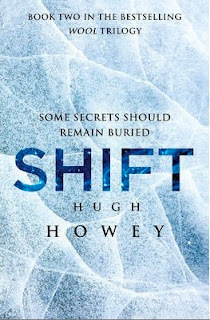 I'm looking forward to meeting all the new characters, because Howey is great at writing them. I haven't read any of her work before, but many people have told me that Lucy Christopher is a great author. I have had Stolen on my shelf for years, but since I received The Killing Woods for review, I thought I would read this one first. Even though it messes with my whole "I must read an author's works in the order in which they were published" thing. Tatum bought it for me, so I am kind of obligated to get to it soon. I hated Beauty Queens by Libba Bray, so I've been putting off buying this one even though it has received a lot of hype and positive reviews. Since I now have it, I'm putting it on my October pile. His books have received a lot of negative reviews, but that makes me all the more interested in reading them. I found these two books in a charity shop for £1, so I decided to pick them up and read them around Halloween. Even if they're bad, I will enjoy ranting about them. Prepare yourselves. I'm listening to The Diviners right now and loving it. I'm glad I didn't make the connection to Beauty Queens, because I read a few chapters of it and returned it to the library. I HATED it. I've not not finished a book in YEARS. Thanks for posting about the Stephen King read a long! Now I'm off to scope it out! What's her twitter? I couldn't find anything about it on her site. 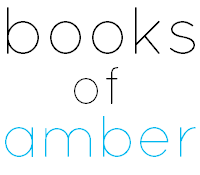 There area few books on your list Amber that I don't think I have ever heard of. But I imagine they will be good. I hope you get the chance to read them. I am curious about the Stephen King novels. The Green Mile gutted me when I first saw it. Congrats on Rome!! It seems a lot of the books are suspenseful, which is fun bc I am looking for a few scary reads for October. YES YES FINALLY THE ASK AND THE ANSWER AND MONSTERS OF MEN! 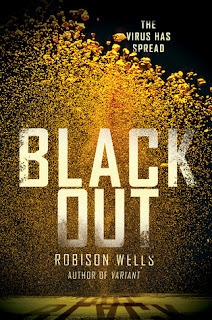 BLACKOUT! AH! RESIST! AH! THE REST OF THEM! AH! YES! Heeeeeee, will you be reading Cirque du Freak WITH me? Then you can, you know, hold my hand. *shudders* I also really want to read The Shawshank Redemption because that movie is perfection. And I want to read The Diviners, but that book is huge and I won't ever have time for it.